Loud toilets can be a startling experience for some passengers, but may soon be a thing of the past — now that researchers at Brigham Young University have developed a way to reduce the noise level by about half. It can be difficult enough to relax — let alone get any sleep — when you're crammed into coach on a red-eye flight. And the notoriously ear-popping flush of the toilets on today's jumbo jets certainly doesn't help. It's irritating at best, and chances are some of your fellow passengers find it downright frightening. Now researchers at Brigham Young University in Provo, Utah, say they have come up with a toilet that is a whole lot quieter. Kent Gee is a professor of physics at the school, and the lead researcher on the project. He spoke with As It Happens host Carol Off about the prototype. Here is part of their conversation. Why are toilets so loud on airplanes? The toilets are loud on airplanes because they use the pressure difference between the inside and the outside of the aircraft in order to flush them. They don't use very much water. Instead of using water and gravity, they use a partial vacuum. That accelerates the water and the waste at high speeds ... up to 150 metres per second — or 300 miles per hour — in order to get the waste down to the waste tank. So what you have is essentially ... there's a valve that maintains that pressure difference. That valve opens, and then the the waste is sucked down the pipes — the tubes — down to the waste tank. And that generates a lot of noise. Where is it going after it leaves the bowl? Typically, there is one — or more — tanks at the rear of the aircraft underneath the floor. And that's where the waste is held during a flight. So the toilets are connected through piping all the way down to the end of the aircraft. 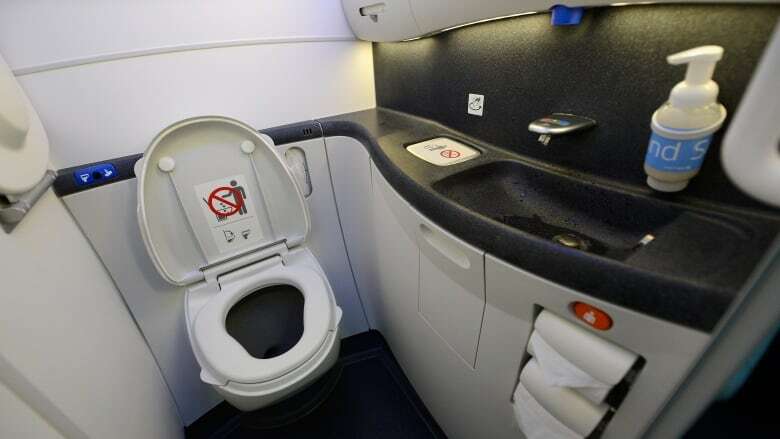 Depending on where the lavatory is ... you could flush that, and it has to make it all the way from, say, the first class all the way back to the end of the aircraft. Where the rest of us are. Well, what kind of complaints do people make about these toilets? Why did you need to fix this? Passengers sometimes won't use the toilets because it's so startling. In their words, people are afraid to use the toilets, particularly kids. And then the other part of it is sometimes if you flush the toilet, it can be heard throughout the cabin. It just makes people reluctant to use it. The toilet you've developed ... what's the difference here? The difference is that the noise on the opening part is — the valve that's opening, first of all — is several decibels, it's less than half as loud as the original toilet. And so we've reduced the opening, the valve opening, noise a lot. And that reduces the startle. And then the second part of it is that the noise while the valve is open is also less. And that's because we reduced some of that turbulence. As the air is moving at high speeds, we've been able to reduce some of that turbulence. And that reduces the noise as well. And so it just sounds less harsh and quieter. OK. So this is now going to be installed on aircraft in North America? Are we going to start seeing these new toilets? We've been able to file a few patents and now we are working with industry partners to get this to market — and hopefully soon. Produced by Sarah Jackson. Q&A edited for length and clarity.